The 9th and 10th grade classes outperformed National Percentile Rankings for each category on the Iowa Assessments. In late September, all our Freshmen and Sophomore students were given the Iowa Assessment and Cognitive Abilities Test over a period of three mornings. This series of standardized tests is designed to provide information which can be used to improve classroom instruction and to report performance in basic skills to parents, students, and the general public in objective, meaningful terms. Please note that standardized tests can never replace teacher-based assessment. It does, however, supplement teachers with additional information that may help clarify a larger picture of student performance. We thank God for each student’s willingness to engage in learning, teachers that mentor and parents that encourage. I am soliciting donations for my gymnastics team. We are in desperate need of new equipment and are running into expenses we don’t have money for. If you have been a member of any of the teams that I have coached you know that gymnastics can be a positive experience and can even be a spiritual channel to touch lives. I need your help to keep reaching young people. If I have touched you positively in any way then I am humbly asking for a donation of any amount. $400 and I will put a banner with your name or company logo in the gym but like I said I will be thankful for even a $20 donation. Here’s my promise. I WILL DO ONE PUSHUP FOR EVERY DOLLAR THAT IS DONATED TO THE MADISON ACADEMY ACROS! ALL IN ONE TIME PERIOD. Go to www.madisonacademy.com/athletics/acros/ to be able to donate directly by credit card. Thank you from the bottom of my heart. On October 25th, the Senior class at Madison Academy hosted the annual Octoberfest where guests came dressed in costume, ate varieties of food and played games of skill. 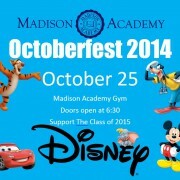 The gymnasium was transformed into a Disney theme park and carnival. There were many activities and food booths ringed around the inside walls. There was a car smash, hayride, zip line, dunk tank, bounce house and a jail with a variety of children’s games, plus Asian food (dumplings, chow mien and fried rice), soul food (veggie fried chicken, mixed greens, hot water cornbread and mac & cheese), pizza and burgers as well as cotton candy, snow cones and smoothies in addition to a costume contest. The young and young at heart enjoyed the evening. “Pace” Fordham finished 1st in the 5K Neely’s Bend Fun Run in the men’s division while Ashley Peterson and Abigail Anderson finished 1st and 2nd respectively in the women’s division. In the 10K our own Mr. Garen Carter finished 2nd for the second year in a row. 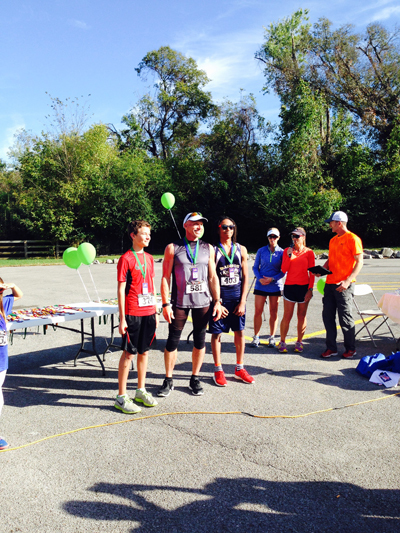 There were over 350 participants that ran or walked in this event. Mrs. Vicki and Will Anderson, Kristin Fulton organized this event and a host of volunteers helped participants park, register, carb up and hydrate in order to achieve their goals. Many Madison Academy students and staff either volunteered or ran in the race. Both Madison Campus Elementary and Madison Academy Athletics received monies in support of their programs.